WHAT DOES A4 PLANNING USE CLASS COVER? 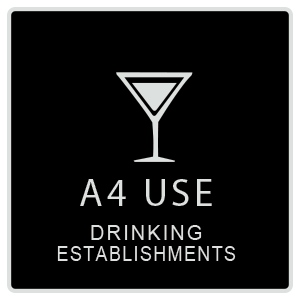 Another very prevalent use across the Capital (and nation-wide) is A4 use class, which is for drinking establishments. This covers public houses (pubs) and wine bars, though not nightclubs. Some planning applications and designs which Commercial Architecture has done have been for drinking establishments under A4, and others have been for nightclubs which fall under Use Class: Sui Generis. We have also done hotel designs which come into use class C1. You can see more information on the lists of uses on the Planning Portal, or on our change of use definition page. The façade and exterior branding is colourful, and is in turn fronted by lush garden beds of trees, flowers and shrubs. The hotel enjoys a very spacious plot with copious parking. The roof signage is also eye-catching to create its own landmark and identity, as may be expected near an airport. This is partly for safety reasons as it is next to a busy road: residents coming from the airport should be able to see it easily. In addition, it sits nestled between 5 other hotels, so its identity needs to be apparent. The Lounge Bar at the Park Inn boasts 4 separate menus for day, evening, children and drinks. The design we did for the bar created an easy space for guests to relax, work or socialise. The Radisson chain has over 380 luxury hotels, therefore our client knew clearly what their aims should be. At Commercial Architecture we have teams of Interior Designers and Branding Specialists, so we worked easily with them to achieve those. The result was a pleasing atmosphere of sweet colour and ambient light. Commercial Architecture have specified FF&E and interior design for several prestigious hotels in London and abroad. These come under Use Class: C1 (although the bars are A4. Technically, they are mixed-use establishments). We also did another project with a unique organic roof shape for a nightclub in Europe. Nightclubs fall under use class Sui Generis, and not A4, as may be expected. If you need a commercial building architect, we can help you obtain planning permission for your change of use application. We can also do your interior design architecture for your fit-out and branding to blend your service perfectly with the new space.